Just a few weeks ago Motion Computing and Intel announced their C5 medical tablet, which had some great features but the $2999 price tag may render it a non-starter. Now another medical tablet, from Emano Tec has emerged. 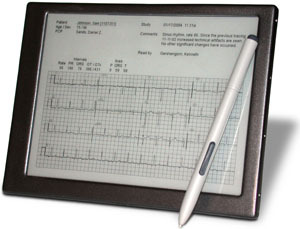 The MedTab is small (5.5" x 7.5"), weighs 1lb, has a 12hr battery, and, most notably, uses an E-ink display. E-ink is a black and white display technology that is extremely low power and requires no backlight. Like the C5 it's washable, offers Bluetooth and WIFI connectivity, and is drop proof (probably even more so than the C5, since it doesn't have a hard drive). Interestingly enough it does run Windows CE, as I proposed, in my entry on the M5. However, the price is still sky high, $4,995 for orders under 50 units and $1,999 for orders over 50. While the form factory and battery life are are definitely a big step in the right direction for a medical tablet, the price is still way to high. White frankly I don't understand why it's so expensive, a Sony E-book reader using a comparable screen costs about $500 and a PDA with comparable specs costs about the same. Given that this is such a new company, I'd imagine the volume they're producing these things at is so low, that it's difficult for them to achieve any substantive price reductions due to volume. After all if ordering just 50 units cuts the price by over 50%, imagine what an order of a few thousand units would do.